Senator Chris Brown (R-2) is sponsoring bipartisan legislation to fight the federal plan to allow offshore drilling for oil and natural gas along the Atlantic Coast. “It simply makes sense to preserve our $44 billion tourism economy and our commercial and recreational fisheries for our children and grandchildren,” Brown said. Focused on combating offshore drilling, the legislation that Brown is sponsoring, SR-29 and S-258, would prohibit offshore drilling in State waters and oppose the expansion of oil and natural gas drilling on the Outer Continental Shelf. The legislation, SR-29, passed the full State Senate. 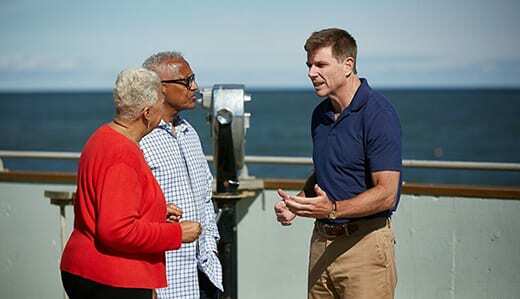 In addition to his efforts on the legislative front, Brown has launched an online petition to provide a forum for New Jersey residents who will be impacted by the effects of offshore drilling to voice their concerns. In January, The United States Department of the Interior allowed access to 90 percent of the Outer Continental Shelf available for oil and natural and gas drilling, including along the New Jersey coastline. Presently, 94 percent of the Outer Continental Shelf is off limits to offshore drilling.